The Great Cities Institute (GCI) in collaboration with the Pilsen Planning Committee (PPC) is engaged in a planning process to create a new Quality-of-Life plan for the Pilsen Neighborhood. This participatory planning process involves key neighborhood stakeholders such as community organizations, service provid­ers, elected officials, property owners, business owners, and residents. In November, GCI began conducting research on the existing conditions in the community to provide background and context for Pilsen’s 2016 Quality-of-Life plan. The existing conditions data report includes information on Pilsen’s neighborhood demographics, housing, local economy, workforce characteris­tics, and community institutions. To engage the community and gather information about resident’s hopes and dreams for Pilsen and a specific actions and strategies that should be included in the plan, GCI designed a participatory planning process. The process includes a multi-faceted approach to engaging the community. December 26, 2015 – March 2016: 26 one-on-one interviews with members of Pilsen Planning Committee (PPC). Individuals interviewed represented the views of 25 different organizations that work in the areas of education, housing, social services, arts and culture, health, law enforcement, and the environment. March 2016 – April 2016: disseminated a community survey. 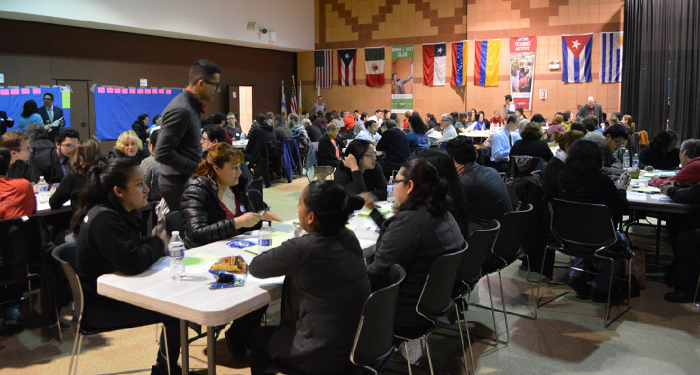 Over 170 individuals that live and work in Pilsen completed a survey. April 6, 2016: Community visioning meeting with over 130 residents, elected officials, and representatives from community-based organizations and local schools. At the meeting, residents were asked to share their vision for the Pilsen community by writing their ideas down (in Spanish or in English) on large index cards and posting them on a large wall for everyone to see. All of the ideas have translated into both Spanish and English. July 20, 2016: 1st community open house meeting with over 75 participants. Youth organized an open house meeting at La Casa where residents and stakeholders reviewed the ideas generated (provided in both English and Spanish) at the community visioning meeting, provided feedback and suggested additional ideas. July 29, 2016: 2nd community open house meeting with over 150 participants. Youth organized an open house meeting at the Benito Juarez College Fair that took place during Fiesta del Sol. Residents and stakeholders reviewed the ideas generated (provided in both English and Spanish) at the community visioning meeting, provided feedback and suggested additional ideas. August 17, 2016: 1st economic development and housing action planning meeting with approximately 20 participants including residents, business owners and representatives from local banks and community-based organizations. At the meeting, participants reviewed the ideas generated (provided in both English and Spanish) at the community visioning meeting and brainstormed specific actions that can be taken to achieve the community’s vision. August 29, 2016: 2nd economic development and housing action planning meeting with approximately 40 participants including residents, business owners and representatives from community-based organizations. At the meeting, participants reviewed the ideas generated (provided in both English and Spanish) at the community visioning meeting and brainstormed specific actions that can be taken to achieve the community’s vision. September 12, 2016: 1st health, community resources, and parks & recreation action planning meeting with approximately 20 participants including medical, mental health, and dental providers, residents, local park supervisors, and representatives from the Paseo community garden and community based organizations. At the meeting, participants reviewed the ideas generated at the community visioning meeting and brainstormed specific actions that can be taken to achieve the community’s vision. September 26, 2016: 2nd health, community resources, and parks & recreation action planning meeting with approximately 6 participants including medical health providers and representatives from community based organizations. At the meeting, participants refined strategies and action generated at the first meeting on September 12 and added additional actions. October 6, 2016: Education action planning meeting with approximately 25 participants including teachers, principals, and representatives from universities, colleges, and community based organizations. At the meeting, participants brainstormed strategies and actions that can be taken to achieve the community’s vision.